Garden Party is an IGT-powered slot game with 5 reels and 1024 ways to way. You can play for as little as 50p a spin to as much as £250 a spin. The game is originally a land-based favourite and has a soft, enchanting art and sound feel to it. 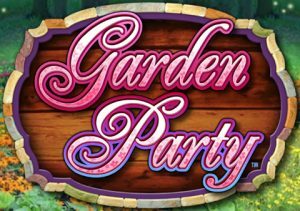 Garden Party uses MultiWay Xtra wagering and has a superb bonus feature where you have a choice of 5 free spins and multiplier options. Garden Party uses the MultiWay Xtra feature (like Fire Opals) where you have 1024 ways to win on each and every spin using only 50 coins. MultiWay Xtra symbols give you a reward for matching symbols in any position in the adjacent columns start from the left-hand side. Saying that, more than 1 matching symbol in the same column will multiply the reward. The Wild symbols substitutes for all symbols except for the Gnome Bonus scatter symbol. So in the Garden Gnome Bonus feature you can choose to receive up to 30 free spins or up to a 20x multiplier – the choice is yours. I personally would go for option 3 as 15 free spins with a 10x multiplier sounds very appealing. Furthermore, you can retrigger the bonus feature up to 3 times if you get 3 or more Garden Gnome symbols on the reels. You will again get to choose the number of additional free spins and the multiplier. I really like the Garden Party slot game due to the bonus feature where you have 5 options – it all depends on whether you value a higher number of free spins or a higher multiplier value. The game is a low to medium variance slot meaning that rewards are fairly common with the wins being on the lower side of things. That said, I thought big multipliers in the feature which result in a high variance game – I was wrong. I haven’t been able to win anything more than 15 to 20 times my stake so I’d rather stick to Pharaoh’s Fortune or other slots which can give you bigger wins in the feature.